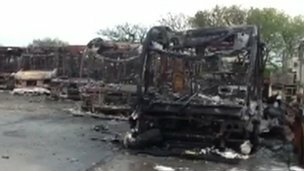 A fire at a bus depot in Cornwall has destroyed at least 37 buses - a third of bus firm Western Greyhound's fleet. The fire in Summercourt, near Newquay, broke out at about 01:00 BST. The blaze is expected to cause "significant disruption" to bus services in mid-Cornwall, including some school buses. Its cause, which is not yet known, is being jointly investigated by Devon and Cornwall Police and Cornwall Fire and Rescue Service. Police said the A3058 Newquay to St Austell Road would remain closed for most of the day. 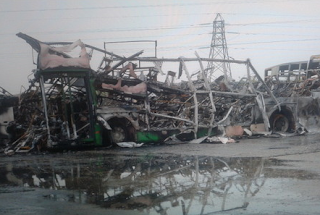 Mark Howarth, Western Greyhound's managing director, told BBC Radio Cornwall: "A lot of hard work has gone into Western Greyhound and it's awful to see it going up in smoke. "I could just see flames leaping in the air and when I arrived all the buses at the bottom of the yard were completely ablaze. "The services will be significantly disrupted but we will run as much of them as we can." Western Greyhound has been operating buses in Cornwall and Devon since 1998. It describes itself as a "locally-based, family-run business."